Textkernel has won the preliminary round of the HR Innovation Slam 2013 on 29 January. The HR Innovation Slam is a German competition in which innovative ideas, projects and products in the field of Human Resources will be presented to the public. The competition takes place in the form of an online webinar, where spectators can watch via their computers and vote for their favourite. Jakub Zavrel, CEO of Textkernel, presented his new revolutionary technology in the field of matching jobs and people. Finding the right employees is difficult and time consuming. Match! by Textkernel provides automatic shortlists of candidates based on the job description. This saves HR staff time and money on finding the right employees. The audience was impressed by all four presentations. All entries received between 22% and 27% of the votes. Textkernel proved favourite and won the first heat. 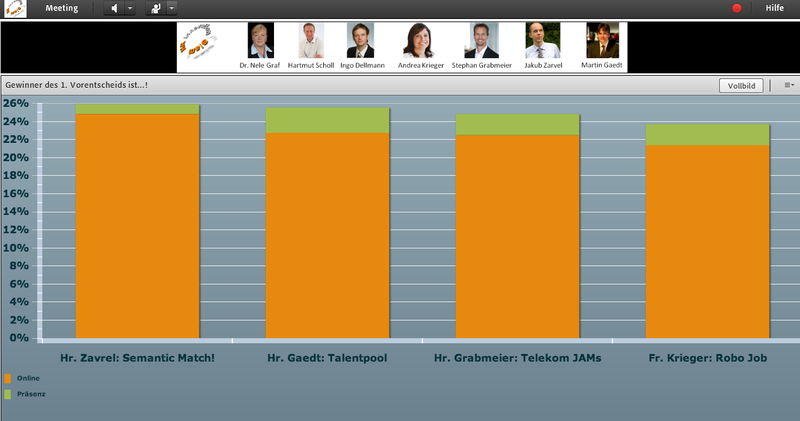 This qualifies Textkernel to participate in the finals that will take place during Zukunft Personal in Cologne.